1. Point Pleasant holds a state-best 43-game regular season winning streak, having not lost in the regular season since October 5, 2012. That loss came on the road, at Oak Hill by a 34-14 final. 2. Mingo Central puts its own winning streak on the line, as the Miners have won 14 consecutive games overall, winning the 2016 Class AA State title. 3. Point Pleasant has won six consecutive season openers, while MCHS has started the season on the right foot for three straight years. 4. A total of 65 players will suit up for the Big Blacks this fall, 36 of which are varsity returnees. The Miners have 56 players on their 2017 roster. 5. The Big Blacks open their 2017 in friendly confines of Ohio Valley Bank Track and Field, where PPHS has won 22 straight regular season games. Point Pleasant’s last home setback came on September 28, 2012, when Brooke claimed a 34-33 win. Last meeting between the teams: August 26, 2016. Wahama won 26-14 in Ravenswood. Current head-to-head streak: Wahama has won 2 straight. 1. Ravenswood’s last trip to Mason was August 28, 2015. The White Falcons claimed a 42-0 win in that game. 2. The White Falcons have won 12 of its last 21 season openers, including nine of its last 10. 3. Since joining the TVC Hocking prior to the 2010 season, Wahama is 10-4 in non-league regular season play. The White Falcons have only went winless outside of TVC Hocking play once in seven years. 4. Both Ravenswood and Wahama have suffered through back-to-back losing seasons. The Red Devils are 5-15 over the last two years, while the White Falcons are 6-14. 5. The Red Devils have 35 players on the 2017 roster, while Wahama has 29, including 17 returnees from last season. Last meeting between the teams: August 26, 2016. Montcalm won 20-14 in Montcalm. Current head-to-head streak: Montcalm has won 9 straight. 1. The Wildcats are hoping to start the season with a victory for the first time since 1999. Hannan is just 2-20 in its last 22 season openers. 2. Hannan last defeated the Generals on October 26, 2007, by a 12-6 final in Ashton. Since then MHS has outscored the Wildcats by a 296-to-77 count. 3. Montcalm’s last trip to Ashton was on August 28, 2015 and resulted in a 50-12 victory for the Generals. MHS has won its last four games at Hannan. 4. Montcalm has 19 players on its 2017 roster, down from 39 last fall. Hannan’s 2017 roster features 32 players, 15 of which return from last year’s 2-8 campaign. 5. This is the first of five home games for the Wildcats, who will also welcome Manchester, Jenkins, Paden City and Cameron to Mason County this fall. Last meeting between the teams: August 26, 2016. East won 49-16 in Sciotoville. Current head-to-head streak: East has won 2 straight. 1. 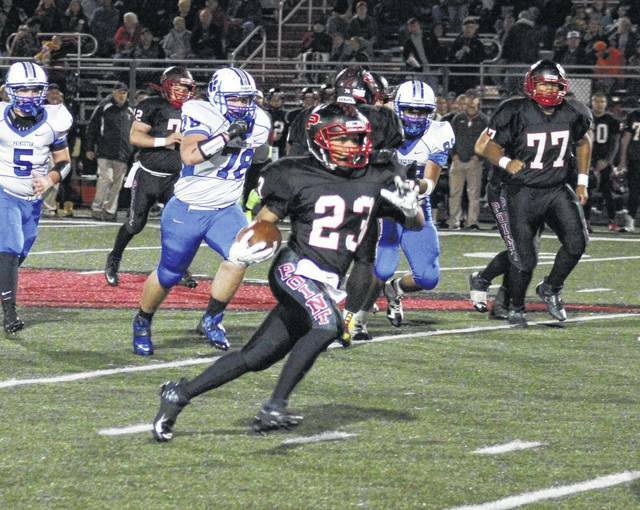 East’s last trip to Mercerville was on August 29, 2014 and resulted in a 48-12 SGHS victory. The Tartans last won in Mercerville on August 24, 2012, by a 36-28 count. The Tartans are 5-2 in Mercerville. 2. East holds a 8-5 all-time record against the Rebels, and has a 326-254 scoring advantage. 3. South Gallia has 26 players on the 2017 roster, 18 of which return from last year’s 3-7 campaign. After an unbeaten regular season last year, East has 39 players out in 2017. 4. South Gallia is just 6-15 in varsity season openers all-time, with a two-year losing skid entering 2017. 5. Since joining the TVC Hocking in 2010, SGHS has only had one season (2010) without a non-league victory. The Rebels are 7-7 in non-league regular season play since joining the TVC Hocking. Last meeting between the teams: August 26, 2016. River Valley won 51-27 in Bidwell. Current head-to-head streak: River Valley has won 3 straight. 1. The Raiders’ last trip to East Shade River Stadium resulted in 57-0 victory for River Valley’s third win of the year. 2. The last time EHS defeated the Raiders was September 18, 2009, by a 41-6 count, in Cheshire. 3. The Eagles have not started the season with a win since 2004, when they topped visiting South Gallia by a 41-6 mark. RVHS is unbeaten in its last three season openers, and the Raiders have started the season on a high note in 12 of their last 15 chances. 4. Since joining the Tri-Valley Conference Ohio Division in 2014, RVHS is 10-2 in regular season non-league contests. Since the expansion of the TVC Hocking in 2010, Eastern is 3-11 out of conference. 5. River Valley features 36 players on the 2016 roster including 21 returnees. Eastern has 30 players on this year’s team, including 19 that were on last year’s squad. Last meeting between the teams: August 26, 2016. Meigs won 42-7 in Gallipolis. Current head-to-head streak: Meigs has won 2 straight. 1. In the Blue Devils’ last trip to Rocksprings, Meigs won by a 26-12 count, on August 28, 2015. That Marauder win ended an eight game winning streak that GAHS held in the series. 2. GAHS currently holds a 24-11 advantage in the series all-time. 3. This is the 20th time GAHS and MHS have opened the year against each other. The Blue Devils have won 17 of the season openers between the rivals. 4. The Marauders have won back-to-back season openers for the first time since 2007-08. GAHS has lost its last four season openers with its last win coming on August 24, 2012, by a 52-34 count at Athens. 5. Meigs roster features 49 players including 27 varsity returnees, while Gallia Academy has 46 players with 22 returning from last season. Last meeting between the teams: August 26, 2016. Southern won 21-14 in Racine. Current head-to-head streak: Southern has won 5 straight. 1. Southern’s last trip to Portsmouth was on August 29, 2015, a game in which the Tornadoes won 21-18 over the Titans, with a last-second goal line stand. 2. Southern has won four consecutive season openers, while Notre Dame has gone four straight years without a season-opening win. 3. The Tornadoes have won at least one non-conference game in each of the last four seasons. Since the expansion of the TVC Hocking in 2010, SHS is 6-8 in regular season non-league play. 4. Notre Dame last defeated the Tornadoes on September 19, 2004. The Titans won that game by a 34-0 final in Portsmouth. 5. Southern has 27 players on its 2016 roster, including 19 returnees from last year’s team. Notre Dame’s 2017 roster features just 17 players, eight of which are freshmen. Point Pleasant’s Keshawn Stover (23) breaks a long run during the Big Blacks’ win over Princeton, at OVB Track and Field, on November 4, 2016.